I would like to share a particle system editor with you (and to say hi to the community! ), which also has somewhat framework-ish minimalistic interface system, which, i hope, someone will be able to use if one will want to. Just launch the code like you usually do. Every numerical value (spin element with +/- sign) is changed with mouse wheel, pressing left shift, left ctrl or left alt increases or decreases value change step for you to get desired values quicker. Clicking on texture list will change particle emitter texture, and "Reload list" button reloads textures from "particles" directory and will load any new files if any. After checking "Use quads" you will be able to add, remove and change system's quads, there will also be a guide drawn on a texture to see which portion of an atlas you have as quad's viewport. Changing spread, direction and area spread will also show guide shapes to clearly see what is going on with the emitter. To the bottom left there is a page controller which you can use to create another emitter with its separate control interface. Clicking on "Code" button will generate emitter code and put it into cliboard (a word of warning to everyone who holds important stuff there) for you to paste it somewhere else. Hope you will find it usefull! PS: list elements arent showing yet that they are scrollable if they have more elements than they can display. Of course, element locations are of my taste, as well as the way this tool works, but i find it somewhat "robust" if you just open a thing and with a few moves create something you can already use rightaway. Last edited by cval on Sun Nov 22, 2015 11:57 am, edited 2 times in total. Is the code on github? And with what license? I watched the video, it seems really cool, and i tried using it and well I don't have a mouse. And it is dependent on the scroll wheel I assume. Which I dont have. Updated some code. Now spin edits (those which were only changeable with scrollwheel) are changing values by clicking or holding mouse button. Left half of element decreases and right half increases value, step modifier also counts. Hello, I am a games assets maker. And I am a newbie for LÖVE2D. 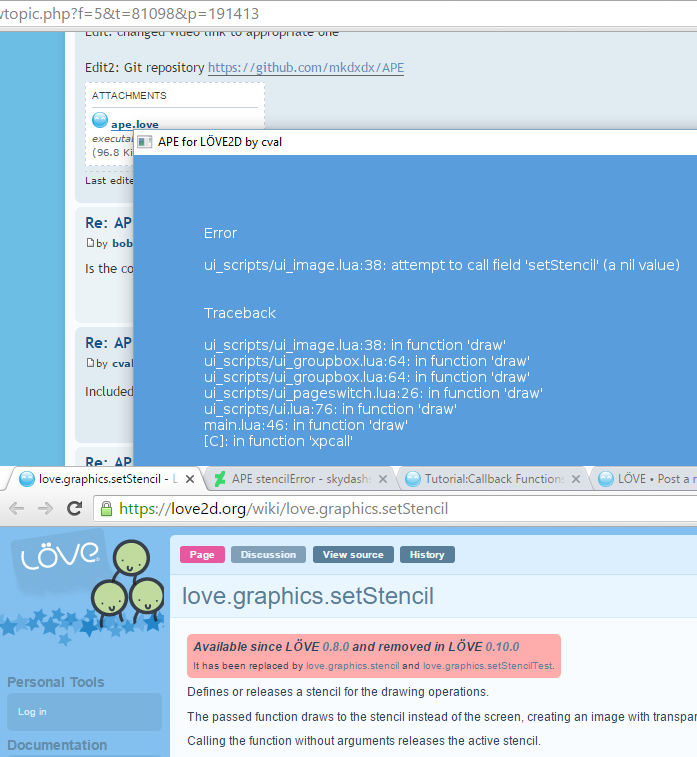 I assume I got error because SetStencil was removed in LÖVE 0.10.0. Do you have a plan to update it ? Been away from workstation for a while. I've updated UI code to work with 0.10, i hope i've corrected everything, so please tell me if i missed anything there! Updated on git (first post) and attached new .love file. Thanks, I just tried it. A couple of gui elements seem to be broken, in the wrong place or not reacting but for the most part it works. Some of the math is also broken, some numbers can not be reset to their initial value. No idea what the code button is supposed to do, it does nothing. Here I tried to do clouds, you can see some of the glitches. It's possible to use folders outside of the love file which i do for colour constructor, it requires a little bit of ffi code, but for editors where you want user editable stuff, it' great. - Add the possibility to enter numbers. Pushing the buttons until you get what you want is OK, but if you know what you want, just entering the number is a lot easier. - In the 'Sizes' section I would prefer to edit the sizes directly rather than use the button next to 'Size'.